← Luminato; Is the light Fading? U.S. Open Golf ala 2012. The 2012 US Open was played on the Olympic Club golf course overlooking San Francisco’s Golden Gate Bridge. The course was constructed in 1920 and is devilishly difficult even without 12 inch deep rough typical of past US Opens. Level lies are almost impossible to come by. A new par 3 8th hole was constructed for the tournament and the 16th hole was lengthened to 671 yards, the longest par 5 of any US Open venue. The weather was good for golf. The professional commentator was Johnny Miller who as a youngster was a merit member of the Olympic Club. He knew the course intimately and his comments as usual were bluntly informative and wryly humorous. Winning the US Open is the dream of every serious golfer and the Ultimate Thule of every professional. Winning the US Open allows a pro to play the Open for the rest of their lives and comes with a 10 year exemption from qualifying for any other tournament. To top it off the prize money is usually somewhere in the range of a million and a half bucks. No amateur has won the open since the legendary Bobby Jones. I had to wonder what the pros were thinking at the end of the 2nd day when they saw their butts were being kicked by a 17-year-old. After all, these guys have high-profile endorsement contracts and enormous egos, though for some of them, the bloom is off the rose. It was a treat watching the antics and agonies of multimillionaires unable to consistently break par. The winning score was 1 over, but there were moments of brilliance. A 17-year-old amateur made the cut, allowing him to play the week end and at one time was just three over, far better then most of the pros. I think in all there were 3 teenagers who finished the tournament. A 14 year-old had qualified! 14 years old? Gimme a break! A 53-year-old Olympic Club member who has spent his entire golfing life trying to qualify for a US Open, made it this year and on his home turf. This guy made the cut and played on the weekend. I’m sure he was not happy with this final score but by golly did he play well. As Johnny Miller pointed out, Tiger Woods – can you imagine calling yourself Tiger – had his game face on and sure enough Tiger played 2 rounds of very good golf. By the time the weekend came around it looked as if the pros were going to grab the tournament back and save face. As expected the amateurs began to fade, but still made statements strong enough to capture the attention of TV execs who gave them equal on- camera time with the pros. The tournament maintained its excitement and wonderful blend of youthful and aged amateur and professionals, many of the latter completely unknown or on their last major tournament go rounds. It came down to the last day. Sometimes it doesn’t. For example, when Ben Hogan, Jack Nicolas and the Tiger of recent fame were on top of their games and leading by a few strokes on Sunday, you could pretty well bank on the final outcome. This time you couldn’t bank on anything. The guy who won is well over 6 feet, looks to be in his early to mid twenties, has a flat belly, blond hair and Phil Mickelson’s baby flushed cheeks and is married. He’s too good looking, too happy and his wife is blond, pretty and seven months pregnant. Almost unknown except to family and friends, he appeared from out of the blue. He had attended Wake Forest University on an Arnold Palmer scholarship. He said he hoped his win would bring a smile to Arnold. He said he had been at peace and had prayed 3 times during the last few holes. Now we have to wait to see if his name ever appears again at the top of a Leader Board. 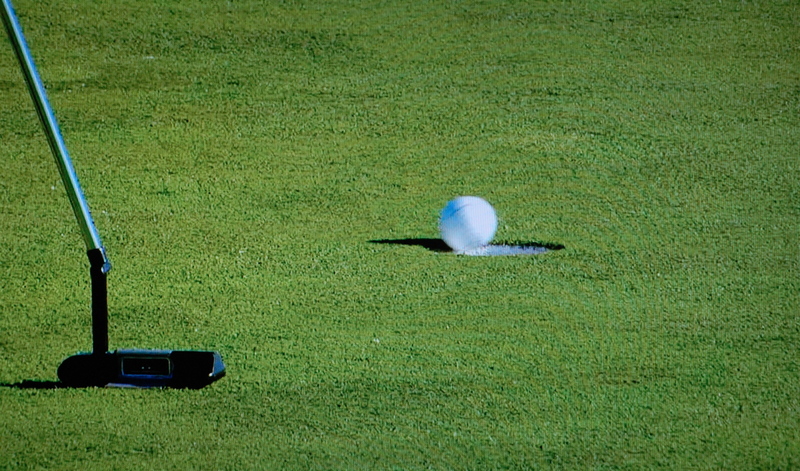 The average pro golf tournament is made for TV and its sponsors. Scores usually range from 10 to 20 strokes under par and if a pro can finish in the top ten a few times, he’s made plenty enough money to live on for the year and probably beyond. It was a satisfying experience to see some of the best players in the world sweating just to get around at level par and not succeeding. Two pros hit tee shots that disappeared into a Cypress tree alongside the first fairway – imagine an eagles nest – and never dropped to the ground. One of those guys provided a real US Open moment when he borrowed a pair of binoculars and stood in the fairway scanning the offending tree. A golfer has 5 minutes to find and identify his ball before declaring it lost and re-hitting his shot. Both players had to make a humiliating walk back to the tee to try again. This US Open was fun to watch and exciting. Tiger Woods, Ernie Els, Jim Furyk, last year’s open winner McDowell and a phalanx of other well-known professional golfers either did not make the cut or committed non-pro-no-nos along the way. The winner of course was the course; the Olympic Club and a winning score of 1 over par. That’s the way it should be. it was oddly entertaining this year. i think it *was* due to the course. i don’t watch golf much but i’ve seen plenty of courses in bits and pieces; i don’t think i’ve ever seen that one before. brutal and interesting. it was great that it went down to the final hole. what’s the name of the guy who won…?